The training is comprehensive and skill building for both the front-line professional and managers of teams. The curriculum is based on real life issues, challenges and realistic methodology that is informed by the individual. What does it take to keep you healthy in the field? How do you feed your mind, body and soul? How do you maintain your resiliency? This workshop will walk you through these questions while providing you with information through which you will gain understanding not only of the effects of our work, but insight into how it affects you personally and how to remain curious and creative on the job. 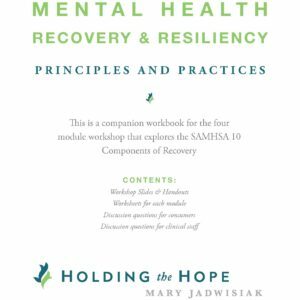 A full-day workshop providing in-depth analysis of SAMHSA’s Guiding Principles of Recovery, and how they relate to healthcare services provided for people with addiction and/or mental health challenges. The workshop discovers how to support people in their journey to wellness – physical, mental, and addiction wellness. It can happen– you can help. Lighten up your life – Resiliency is an essential component to recovery and life! This 1-hour workshop, designed as a lunch and learn wellness class for all employees, identifies strategies for developing a capacity to be resilient. Participants leave the workshop with practical steps they can take to develop or increase their capacity to be resilient. The skills leaned are applicable for anyone wanting to increase their power as they navigate life’s challenges. This half day workshop is designed for receptionist, front office staff, clerical workers, maintenance staff or any other non-clinical employee who encounter people experiencing mental illness or substance us disorders during the course of their jobs. This workshop is also perfect for social service providers who are not behavioral health professionals, but work with people who experience behavioral health issues. 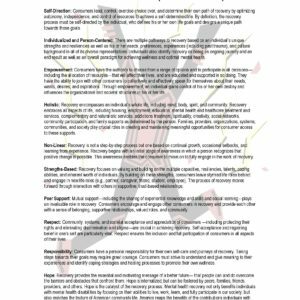 The 10 critical components of recovery and how you can support them. Understanding your role in the healing environment. How to deal with difficult or delicate situations. Tools to use daily as you go about your job. 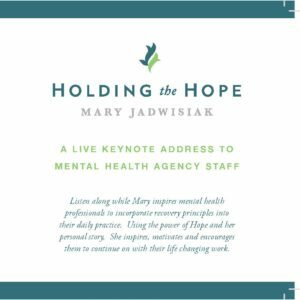 Holding the Hope will help you create and implement custom Peer Support, WRAP, and Suicide Prevention programs and workshops. Contact us today to see how we can help you design the most effective program for your group's specific needs. Sign up for our informational messages and resources.